Seven-Card Stud is among the most popular poker variations of all times, not to mention, it is the first variant to spread and gain recognition on a global scale. It all began in the 1860s, during the American Civil War when the game went by the name of Stud-Horse because at the time, it was hugely popular among cowboys from the Mid-West. What cowboys initially played was Five-Card Stud but at the turn of the 20th century, this variation evolved into what we know as Seven-Card Stud today. It held the status of the most widely played poker variation in the world until Texas Hold’em emerged in the 1980s. If you are new to Seven-Card Stud poker, we suggest you take a peek at the following article to learn more about the game’s rules and its betting structure. 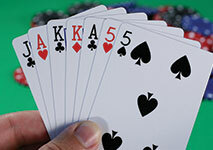 Many experienced players consider Seven-Card Stud the purest form of poker because this variation relies heavily on tracking and remembering the cards and hands that have been dealt, whereas, in other variants like Texas Hold’em, the players often resort to misleading their opponents through bluffing and rely on creative betting patterns. Also, Seven-Card Stud is played at a much slower pace as each hand requires twice as much time as a Texas Hold’em hand to play out. Seven-Card Stud utilizes a standard French deck, consisting of 52 cards, which can serve two to eight players. However, the optimal number of participants is said to be five to seven because with eight players, a certain probability exists of exhausting the deck at the end of a deal. Before any cards are actually dealt, each player is required to contribute to the pot by placing a forced bet, called the ante. The ante’s amount varies from one table to another and depends on the limits, set for the particular game. There are five betting rounds in this variation. Once a pot has been created, each participant is dealt two hole cards and a third card that is facing up. This face-up card is typically referred to as the “door” or the “window”. At the start of the first betting round, the player who has been dealt the lowest-ranking door card starts the action by placing another forced bet, called the bring-in. If two or more players have been dealt door cards of equal rank, the tie breaks on the basis of the suits in alphabetical order – clubs (lowest), diamonds, hearts and spades (highest). The players can choose from several betting actions. They can either choose to fold (discard their hand), match the amount of the bring-in, or raise to the full bet. Play proceeds in a clockwise direction until all participants have acted on their hands. At the start of the next betting round, each participant who remains in play is dealt a second face-up card, with players again choosing one of the above-listed betting actions. During the third, fourth and fifth betting rounds, players are dealt their fifth and sixth cards facing up and a seventh, face-down card. They have the option to check, bet, fold, call or raise. On later betting rounds, the first player to act is the one showing the highest-ranking face-up cards. The cards’ rank is determined by their face value. Thus, face or picture cards are ranked from the highest to the lowest as follows King, Queen, and Jack. Note that the Ace is considered the highest-value card during the bring-in only, which means it ranks higher than the King. The aim is to form the best possible five-card poker hand from the seven cards one has been dealt. When all have received their seven cards, the Showdown starts – everyone exposes their hole cards and the player with the highest-ranking hand collects the pot. Similarly to a game of Hold’em, players are required to make forced bets, so that a pot can accumulate. Before the game starts, everyone at the table needs to pay an ante before they actually receive any cards. The amount of the ante varies from one table to another and depends on the betting limits set for the game. The person with the lowest-ranking door card is the one to pay the bring-in, which is the second forced bet in Seven-Card Stud. As Seven-Card Stud is usually played at a fixed limit, the amount of the small and the big bet in the game is determined in advance. For instance, the small bet may be $5 while the big bet may stand at $10. The ante’s amount is typically 10% of that of the small bet, or $0.50 in this example. However, if there is no mandatory bring-in in the game, a bigger ante is enforced. More often than not, the forced bring-in is less than the amount of the small bet but is much bigger than the ante. So, with a small bet of $5 and a big bet of $10, the bring-in may be around $2. However, the player, who starts the action, can opt for placing the full small bet of $5 instead of paying the $2 bring-in. Please note that during the opening round and the bring-in, no one is allowed to make big bets. When anyone shows a pair or a higher-ranking hand during subsequent betting rounds, all players are allowed to make big bets or raise, including those who do not actually hold a pair themselves. In some instances, big bets are accepted from the fifth betting round onward. In Seven-Card Stud, evaluating which starting hand should be folded and which one should be played is of crucial importance. The most common way to do this is by determining whether the cards, needed to form a good hand, are “live” or in other words, whether they are still in play. If the chances of improving one’s hand are minuscule, it would be better to fold it altogether. We can distinguish between five main types of starting hands in Seven-Card Stud poker, namely the Three of a Kind (Rolled-up Trips), the Big Pair, the Small and the Medium Pair, and the Drawing hand. In this particular variation of poker, the Three of a Kind, or Rolled-Up Trips, is considered the optimal starting hand. Do not count on getting a Three of a Kind too often, though, as the odds of hitting this starting hand stand at 424 to 1. The following is an example of a five-card hand containing a Three of a Kind – [A][Q]. The Three of a Kind is definitely a strong hand to start with, not to mention there is always a possibility for the skilled player to improve it on subsequent betting rounds. Furthermore, the Three of a Kind is “well-hidden”, so to speak, because opponents can see only one of the cards in the starting hand. However, it all depends on how players are positioned around the table. If you are not the first one to act, and several players have already contributed to the pot before your turn comes, they will be less likely to fold if you raise with this starting hand. Most of all, while strong, the Three of a Kind is not an invincible hand and can occasionally lose. The Big Pair is yet another good starting hand in Seven-Card Stud and as a rule of thumb warrants more aggressive play and raising. When players are up against one or two opponents only, it is possible for them to collect the pot with a Big Pair without attempting to improve it. However, drawing to at least another pair is considered the surest way to prevail in one such situation. Your chances of winning with such a hand would further improve if you are holding what they call a “buried Big Pair”, so that both paired cards are hidden. This would make it extremely difficult for your opponents to properly evaluate the strength of your hand. An example of a Big Pair would be [K][K][A]. As you can probably see yourself, whether a given pair of cards is considered big, medium or small depends on the face-ranking of the cards. From this, it follows that a Medium Pair consists of two paired cards of medium rank, for instance [K][A] or [Q]. An example of a Small Pair would be the following – [A]. Whether or not starting hands containing Small and Medium Pairs should be played or folded depends on two additional factors. The first thing you need to take into consideration is whether the cards you need to improve your hand are “live”. If they have been already discarded or dealt, improving your hand may turn out to be impossible. The second thing you need to consider is the rank of your kickers i.e. side cards. For instance, if you are holding a Small Pair, but have higher-ranking side cards, you still have a chance of defeating your opponent. This is so because Small and Medium Pairs generally need to pair higher-value side cards to win. Unlike the Three of a Kind or paired hands, Drawing hands do not possess any present value. They do, however, carry a potential for major improvement. A Drawing starting hand may consist of three suited cards like [K][Q], or of three cards of sequential rank like . In such instances, there is a scope for improvement. The first thing players need to do in a situation like this is to check their opponents’ face-up cards to see whether the cards they need to improve their Drawing hand are still “live”. If two or three of the cards you need to complete your hand have already been dealt to somebody else, it would be wise to fold your Drawing hand altogether. A good amount of discipline is required to evaluate whether or not to release a Drawing hand. Similarly to other poker variations, in Seven-Card Stud players can choose to call, bet, check, raise or fold. Calling involves matching the bet amount of the player, who has acted before you. Checking is an option when players wish to decline betting while still remaining in hand. Then again, when players fold, they are relinquishing their claim to the pot and are no longer in hand. When somebody raises, they are placing a bet that exceeds the amount of the bets placed by their opponents. Typically, cardrooms allow for three to four raises for a single betting round. Usually, the only exception to this rule is when two players are in a heads-up battle for the pot. On that note, it is also worth mentioning that bets and raises in Seven-Card Stud games with fixed limits are of pre-determined amounts. Which betting option a player chooses largely depends on how their opponents have previously acted. If other players have not made bets yet, you can either bet yourself, or check and still stay in hand. Provided that someone has already made a bet, there is the option to call that amount, raise to a higher amount, or fold and give up on your hand for the round. After the deck is shuffled, the opening betting round can begin. Each participating player is required to pay a nominal entry-fee, called the ante. The latter seeds the pot and is practically dead money because it is not counted as part of the players’ bets. The exact amount depends largely on the limits set for the game, which are displayed on the plaque placed at the table. In most cases, the ante amounts to about 10% of the big bet’s size. What follows next is what they call the bring-in. One of the players is supposed to “bring it in” in order for the betting action to start. In some instances, this is the player sitting directly to the croupier’s left. Another way to determine who starts the action is by the value of the door cards players have been dealt, in which case, the person showing the lowest-ranking door card acts as the bring-in. If two people show door cards of the same value, the suits are used to break the tie. Clubs are the lowest-value suit, followed by the diamonds, the hearts and finally, by the spades. Then, the player to act as a bring-in can either match the amount of the ante or may opt for betting the amount of the pre-determined small bet. The first betting round in Seven-Card Stud is referred to as the Third Street and starts with the player who sits to the left of the bring-in. They can call, fold or raise. Betting proceeds in a clockwise direction with players calling, folding or raising. If the bring-in matches the amount of the small bet, the first player to act is allowed to raise only to an amount that does not exceed twice the size of the small bet. Once everyone at the table has acted, the second betting round, or the Fourth Street, can commence. Each player remaining in hand is dealt another face-up card. The player holding the highest-ranking face-up cards is the one to start the action. For instance, if player A shows a [K][K] and no one else is showing a pair of Aces or higher, player A will be the first to act. Betting then proceeds clockwise with remaining players choosing to check, call, bet, raise or fold. Please note that some of the worst cards to show on the Fourth Street are . At this stage of the game, having any pair is better than holding two unpaired cards. For example, a pair of  is preferable over having [A][K]. After the Fourth Street is over, the Fifth Street or the third betting round, can begin. The croupier then deals yet another face-up card to the players, starting with the first person to their left who remains in hand. It is again the player who shows the highest-ranking face-up cards, who starts the action for the round. It is at this stage of the game that showing a Three of a Kind or at least a pair is considered an advantage. From this point onwards, players must bet or raise to the amount of the big bet. At the start of the Sixth Street, everyone is again dealt a face-up card by the croupier. At this stage, everyone would have four cards that are facing up. The player showing the highest-ranking up cards starts the action and it moves clockwise from there. What follows next is yet another betting round, similar to the previous ones. The Seventh Street is the fifth and final betting round in a game of Seven-Card Stud. At this point, the croupier deals a final card to each remaining player, but this time, the card is dealt facing down. Because of this, the action starts with the player who has shown the highest-ranking cards on the Sixth Street. Each player then acts in turn. Note that the big bet’s amount is utilized for the Seventh Street as well. When all players have made their move on the Seventh Street, the Showdown can begin. The objective is to try and form the best possible five-card hand using the seven cards you have been previously dealt. The other two cards that are not used to form the hand are referred to as “dead’’ and are not considered when evaluating the hand’s strength as they are deemed of no value. The ranking of the hands coincides with that in Hold’em poker, which means a Full House would prevail over a Flush or a Straight, for example. Thus, if player A holds a five-card hand consisting of , they would defeat player B who shows [Q][Q][Q][Q]. If everyone at the table has folded save for a single player, the latter would claim the pot. We can distinguish between three main types of betting limits in a game of Seven-Card Stud, namely fixed, pot and spread limits. The fixed limit is the most common one in this particular variation of poker. Whenever there is a fixed limit at the Seven-Card Stud table, the betting limits stand at set amounts. Such fixed games usually have a double limit as the small bet’s amount is used on the first two betting rounds and the big bet’s amount applies for the subsequent Streets. However, there is an exception to this rule whenever a given player shows a pair of hole cards on the Fourth Street, in which case small and big bets are both acceptable. For instance, you may join a game where the small bet stands at $5 and the big bet amounts to $10. In such cases, the ante is typically 10% of the big bet’s amount or $1 in this example. The minimum bring-in should be at least the amount of the ante. Thus, a bet in one such game can amount to $5 (the small bet) and the raise should be the additional $5 for a total of $10, for the first two betting rounds. In subsequent rounds, players will be allowed to bet $10 (the big bet) and raise to $20. In fixed-limit games, the number of raises is capped. Though less common, some tables utilize a spread limit. This type of betting structure is used exclusively in Seven-Card Stud poker and is not common in other variations of the game. However, as this is still a relatively rare structure, the rules tend to fluctuate greatly from one cardroom to another. Again the amounts of the small and big bets are set in advance. The bets made on all Streets should be fit within the minimum and maximum limits. In some variations, the limit is doubled after the second round. In this case, the plaque at the table may read “$5 to $10, with a $20 on the end”, which is to say players can bet as little as $1 and as much as $20 on later Streets. Most spread-limit tables do not utilize the ante as an entry-fee, but if they do, it typically is set to 25% of the small bet or $2.50 in our example. The minimum amount players can usually “bring in” at such tables is either equal to the ante (if there is one) or to the bottom end of the spread limit. Players, who enjoy more action, are recommended to join a pot-limit table. As there are more betting rounds in Stud games as compared to Hold’em variations, the pot can reach a more substantial amount. In such games, the ante usually amounts to about 1/200th of the buy-in. So if the buy-in is $100, the ante would be $0.50. In most cases, the bring-in is equal in size to the ante. The amount of the small bet is calculated by counting all the money the players have contributed to the pot, plus all the bets placed at the table.